This warming gluten free soup is dairy free too, as well as being full of good nutrients and low in fat. 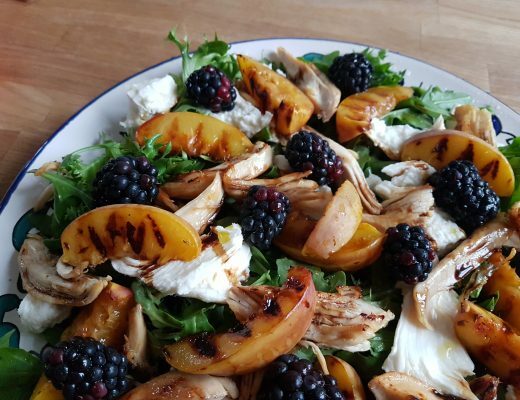 Perfect whether you are eating healthily or just want a big bowlful of deliciousness. This soup is very lightly curried in flavour – cumin, coriander, paprika and chilli merge to give a fragrant edge to this gluten free soup. Of course, you can omit the chilli if you really dislike spice, but the quantity is so small it won’t have your taste buds burning. 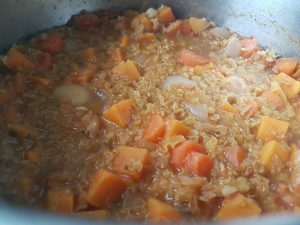 The carrot and sweet potato lend beautiful sweetness and the lentils build a wonderful thick texture. 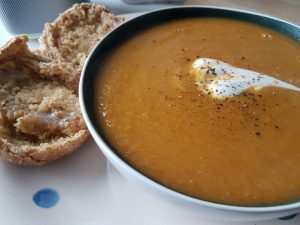 This soup cooks for slightly longer than other recipes (total cooking time 1 hour, inc prep), as the slow cooking helps those lovely flavours to develop fully. 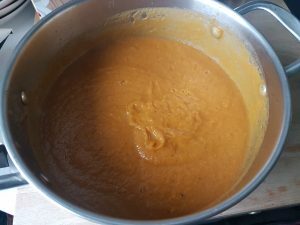 Make a big batch as this gluten free soup freezes well and will also store in the fridge for a few days after you have made it…if it lasts that long! We were surprised by delicious this soup turned out to be and I hope you all enjoy it as much as we did. 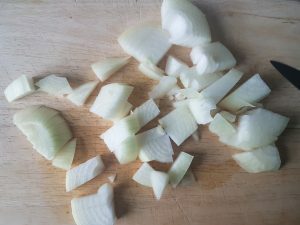 Roughly chop the onion and fry in a large saucepan in a small drizzle of olive oil until the onion has started to soften (5 minutes). Peel the garlic cloves and crush them flat with the side of a large knife. Add them to the pan with the onion and fry on a medium heat for 2 minutes. 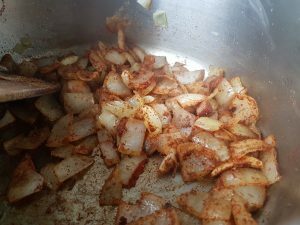 Add the cumin, paprika, coriando and chilli to the onion and garlic and cook for a couple of minutes until you start to get fragrant aromas. 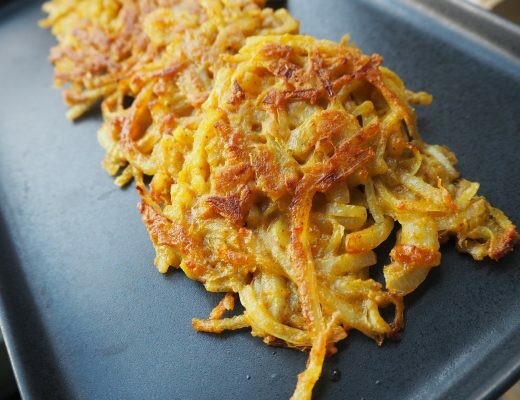 Chop the potato into small cubes, the carrot into small chunks and then add both to the pan. Stir well to coat them in the spice mix and cook for 5 minutes to allow the flavours to develop. Then add the dried lentils and the hot vegetable stock to the pan. Pop the lid on the pan then leave it to simmer over a medium-low heat for 45 minutes. This slow cooking with allow the potato and carrot to become soft and sweet. The lentils will bloom and split as they also become soft and absorb the stock. Using a hand blender stick, blitz the soup to turn it into a smooth puree. Add at least 200ml of water to thin it down – adjust the quantity per your personal preference. I like this soup nice and thick, but if you add more water it will go further. Warm the soup again on the stove, adding any salt and pepper if needed (it might not need any seasoning). Then serve the gluten free soup in big bowls alongside some buttered gluten free bread. 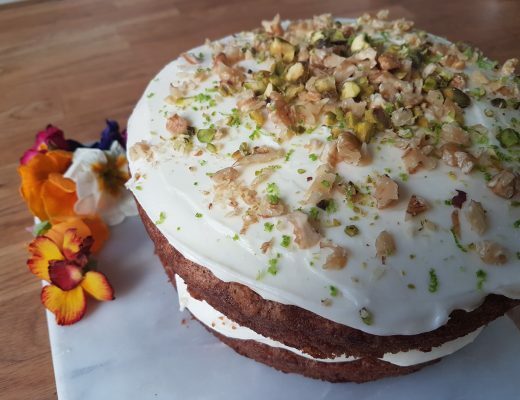 You can add a dollop of yoghurt or creme fraiche on top if you want to make it look fancier, along with a sprinkling of coriander or cumin seeds. 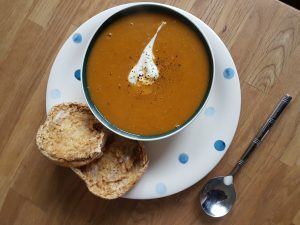 Try serving this gluten free soup with my gluten free flatbread – they are perfect for mopping up this delicious carrot soup!